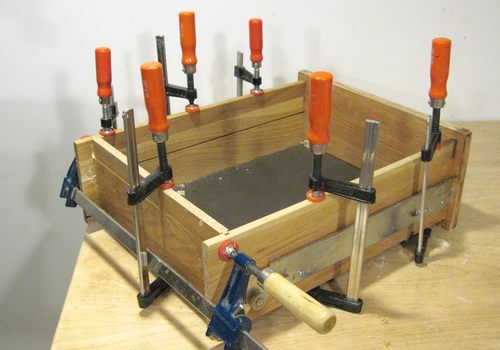 I used to just keep my planer on a milk crate on small dolly. 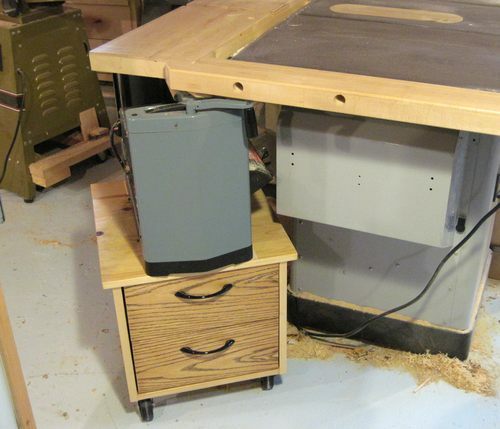 I kept it low to the floor, not for ergonomic considerations but because that way, I could just roll it partially under the extension of my table saw. 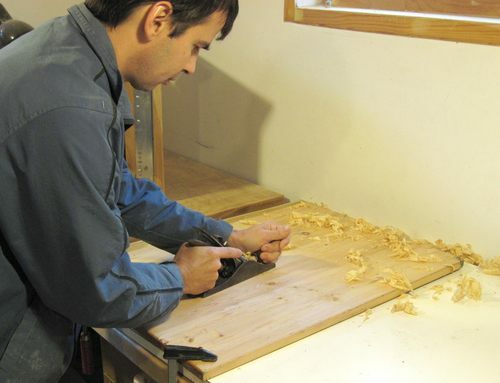 I don't use the planer that often, and I don't have a problem bending down to use it. 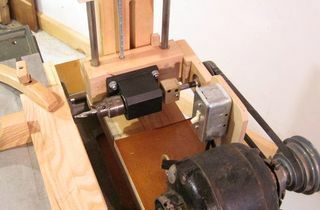 But finally, I decided that I should build more of a proper 'stand' for the planer. I made it out of panels of recycled lumber. Some from the trash, some from Ikea shelving. They were already glued up to the width I needed. But one of them did need some re-planing. So I planed it by hand. I'm not much into hand planing, and is perhaps ironic that one of the few times that I hand planed some stock was when making a stand for a power planer! I figured this project would be a good chance to use my newly built horizontal boring machine to join the box for the stand with a precisely aligned row of dowels. 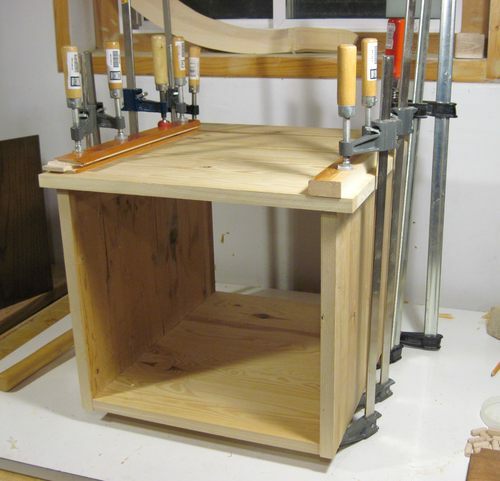 I couldn't use my box joint jig, because the panels were too wide to fit in it. 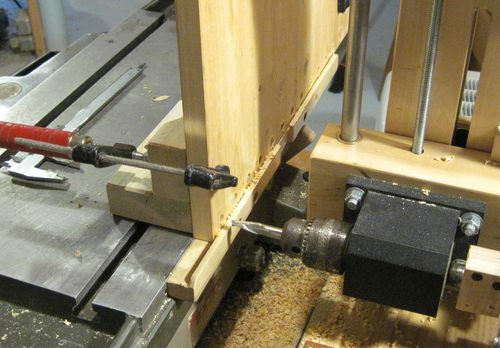 My home-made horizontal boring machine has an indexing feature that allows me to precisely and repeatably drill holes at fixed intervals. Though, it turned out, the pieces, with a width of 45 cm, were still too wide for the sideways range of motion of my horizontal boring machine. I had to move and re-clamp the panels once each to get the whole series of holes in. The horizontal boring machine is ideal for drilling holes in the end or edge of a board or panel. To drill the holes in the face of the panels, I could have just used a drill press. 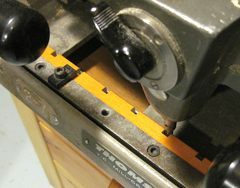 But I still wanted to use the machine's indexing feature, so I had to make an L shaped jig to hold the panel on the machine. I bought these special dowels, pre-compressed, cut, and, most conveniently, tapered on both ends. They didn't cost that much more than it would to cut up a regular a dowel myself, but they saved a lot of time. 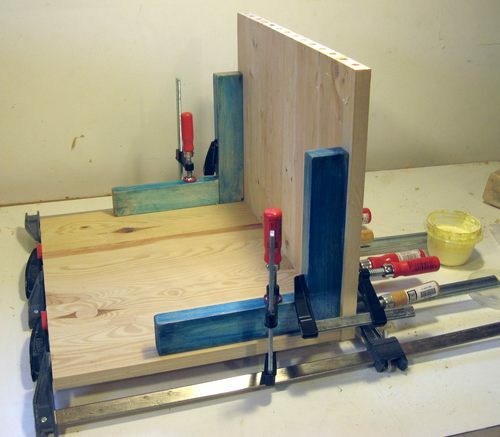 I have since experimented with making joints like that using a self centering dowel jig and a jig of my design that I like to call a dowel jig t-square to make similar joints without a horizontal boring machine. 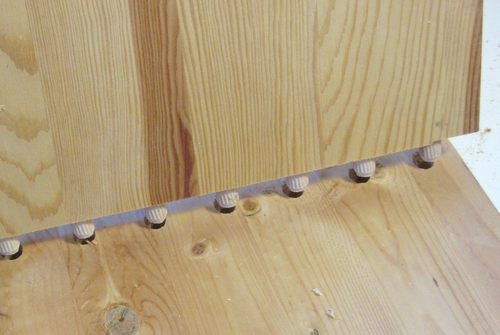 The tapering of the dowels really makes it easier to get the joint together. And with 14 dowels all in one row, once I got the first two lined up, the rest of them were just guided in by their tapers. 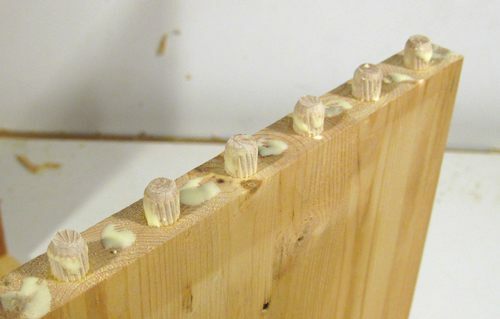 To be on the safe side, I applied glue to all the surfaces, as well as the dowels. 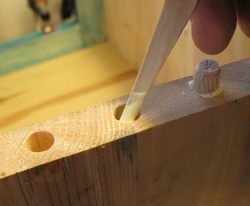 I used a wooden split to smear the glue on the insides of the holes before inserting the dowels. 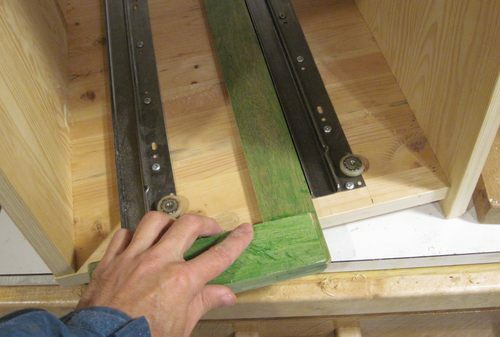 Clamping the first joint together. 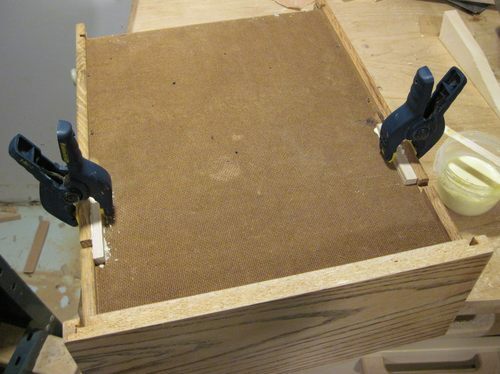 I used some home-made clamping squares to ensure that the joint was all square. 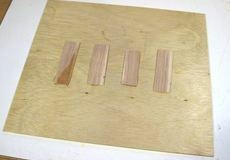 The clamping squares are just some very sturdy squares made out of maple. 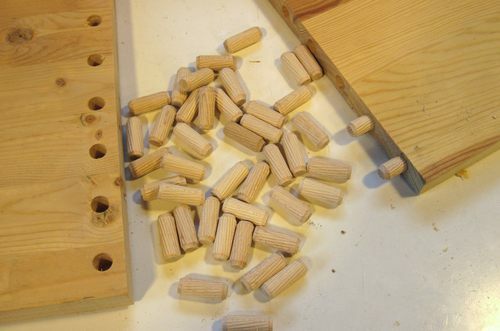 The idea is to just clamp them to the work while gluing up to force the joints into square-ness. Clamping on the top of the box. One end of the box would be open for the drawers. The other end, I closed with plywood. I had a scrap of nice veneer plywood lying around that was just over half the width of what I needed, so I joined the two pieces, edge to edge, by gluing a few thin pieces of wood against them. These joining pieces face the inside of the box, so they aren't visible in the assembled stand. The joint is just noticeable from the other side, but it's not that critical for a piece of workshop furniture. 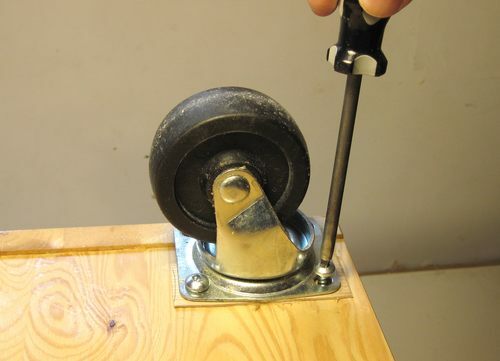 I mounted the casters directly to the underside of the box. With the sides of the box protruding past the bottom just a little bit, I had to make some shims to get the casters to mount level. 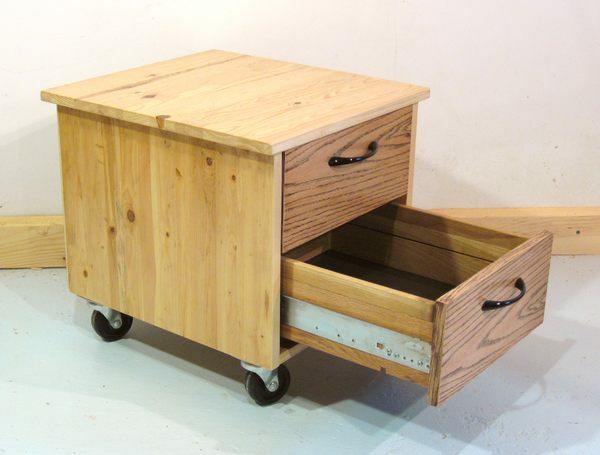 For the drawers, I used some drawers that I trash picked. They had solid oak sides, but just veneered particle board for the front. I ended up knocking some of the joints apart a little to re-glue them. Recycling drawers always seems to involve some repair work for me. 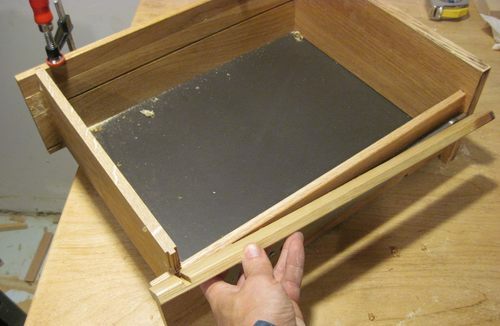 But it sure does cut down on material, and it's still less work than making drawers from scratch. I decided that the drawer's sides should be higher than they were. So I cut up one extra drawer, and cut strips from the sides and back pieces to make height extensions for my drawers by gluing them onto the tops of the existing sides. The drawers already came with metal drawer glides, though, unfortunately, these are not to the full length of the drawers. Also, ironically, they were mounted somewhat inaccurately. The lack of precision in some factory made furniture can be quite surprising. So I started by calculating where the drawer slides in the case should mount, and mounted them without consideration of where the slides were on the drawers. Then I re-mounted the slides on the drawers so that the fronts all line up square on the front. The green thing I'm holding is a wooden try-square. 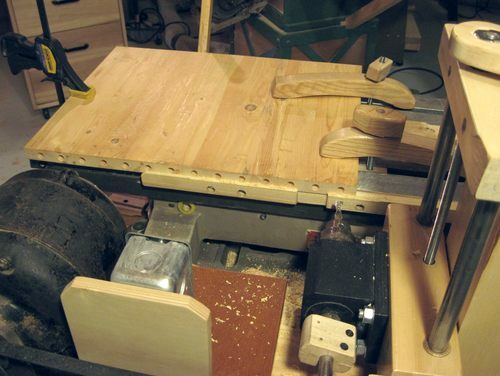 And here's the planer stand "in use". 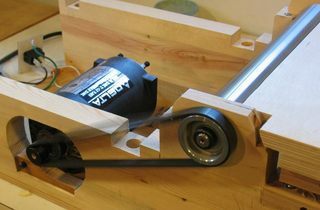 With my cheap delta planer on it, parked partly underneath my table saw extension. Overall, the only new material on the planer stand is the dowels that I used. 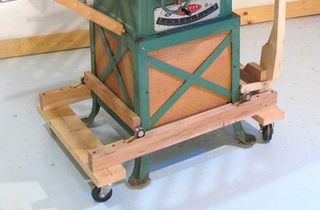 And maybe the casters, seeing that I took those off the dolly that I had originally bought new.